I had a conversation with my mom this morning, she told me she made passatelli, suddenly I got the irresistible urge to make them too. When I lived at home, I was never a fan of them, probably because that soup was served way too often. Between my grandma and my mom, we ate passatelli maybe once a week. When you eat something all the time, the excitement goes away. I guess tastes change when you grow up and move out of your country. 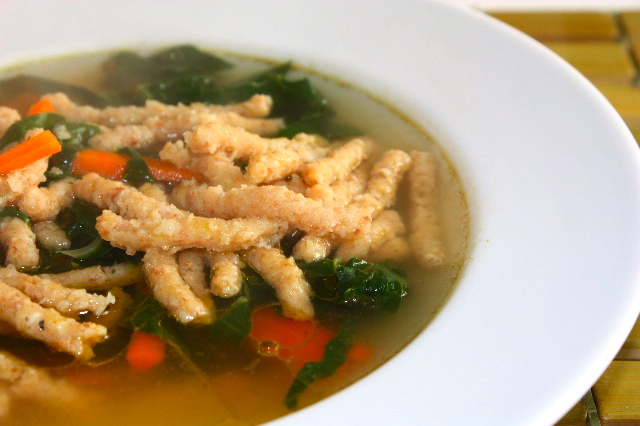 This is a regional soup very common in Romagna and Marche regions of Italy, it’s traditionally made for some festive occasions, but then people end up making them when they feel like it. It’s another peasant dish made basically with breadrumbs, parmesan, eggs, nutmeg and if you want lemon peel (I like it better without it, I think the lemon is too strong). The original recipes is made with a chicken or beef broth (or sometimes a combination of both). I like it also with just a vegetable broth. Here, the broth has been enhanced with chards and carrots “en julienne” (cut in tiny strips), so you get a little texture and color and of course the benefits of eating vegetables. I always ate broth made with hen instead of chicken, hen is fatter and takes hours to cook, so it’s mainly used in broths. Nowadays people use chicken in their broth, probably because it takes less time to cook. It’s important to “degrease” the broth from the deposits and fat the meat produces (if you’re using meat) while cooking, so you’ll get a clear and healthy broth. When making passatelli usually, you eat the boiled meat along with the soup called “lesso“, I have never been a fan of it, and remember my dad pouring tons of black pepper and olive oil on top of his meat. You need to have that particular kind of potato masher (schiacciapatate) like this one, to make those little round and long threads (not sure how to describe them). There is another tool used to make passatelli but I don’t think it’s available in the US. I like to make my own breadcrumbs with old and hard baguette or what is called “Italian bread”, I grate it and get great quality crumbs. The ones you buy already made in stores tend to have an unpleasant taste, and for the passatelli home made crumbs work much better and hold the paste together well, so when you drop them in the broth, they don’t break. Using a large pot, mix ingredients with water and let it simmer for a while at least an hour. If using hen, it might take over 2 hours. Regularly, remove the deposits you get on the surface of your broth (especially, if you are using a meat based broth). When the broth is cooked, remove all the vegetables and residues and drain it through a sieve to get a clear broth. Add carrots and chopped chards, and let it cook for a few minutes, until the carrots are cooked. In a mixing container, mix, breadcrumbs, parmesan, eggs, flour, nutmeg, salt and pepper. Mix well and let it rest for about an hour. You need to have a hard enough mixture, but not too hard or it will not go through the potato masher. Fill the potato masher with the dough mixture, bring the potato masher on top of boiling broth and squeeze to produce the passatelli, then cut the base with a knife. The passatelli will drop on top of your pot. Cook for one minute or so. Remove from the stove, sprinkle wit olive oil and serve hot. This entry was posted by silvia on December 1, 2009 at 9:30 pm, and is filed under Soups. Follow any responses to this post through RSS 2.0.You can leave a response or trackback from your own site. I love this! What a pretty soup. I’m going to try this soon, but I doubt mine will look as good. I think the soup looks simply light & delicious! I love the way it served together with all those veggies & herbs. So aromatic! What a lovely soup. It’s light and just perfect like tonight. Yum. Wow. 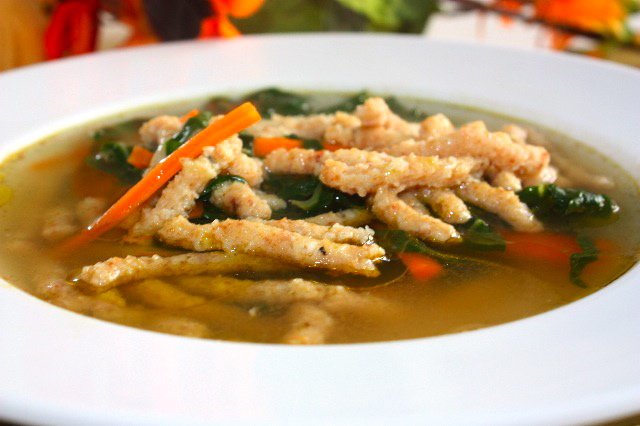 This is a great healthy and hearty soup. Well done. This looks beautiful! I love the shapes — they kind of remind me of Japanese rice crackers that come in a similar long, blunt-nosed shape! By the way, congrats on your “Naked Ravioli” being number one on FoodBuzz Top 9!! thanks! what did you use to make them? Thanks! I don’t know how to describe them, quite difficult to find an accurate word for that shape. I will attempt to make this. looks so good and delicious. This looks delicious! Good work.